Vancouver, British Columbia--(Newsfile Corp. - December 17, 2018) - Jaxon Mining Inc. (TSXV: JAX) (FSE: OU31) (OTC: JXMNF) (the "Company") is pleased to announce that on November 30, 2018 it completed 23 line km 2D Induced Polarization (IP) and ground magnetic surveys at its Red Springs project, near Smithers, B.C. The Company has received the interpretation of the survey data from Simcoe Geoscience Ltd. of Toronto, Ontario. The survey identified multiple high priority chargeability anomalies for both the gold-cobalt tourmaline breccia mineralization and a number of associated porphyry targets where occurrences of the tourmaline breccia mineralization and porphyry targets are part of an associated geological system. The IP and ground magnetic data was acquired between August 22, 2017 and July 11, 2018. The survey consists of 7 lines and a total of 23 line km data (Figure 1). 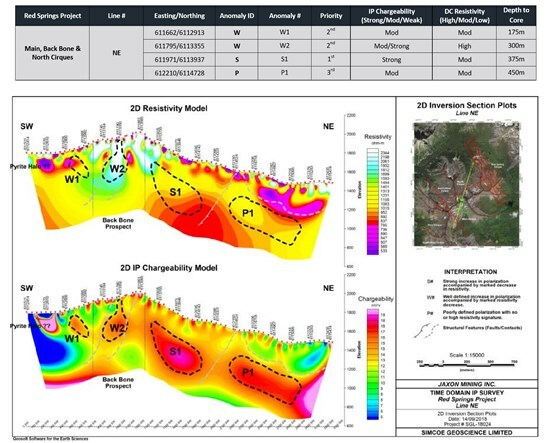 The IP data was acquired using 'pole-dipole' configuration with dipole 'a' spacing of 100 m. The main objectives of this survey are to map chargeability and resistivity responses over the selected areas to a depth of at least 800+ m and to detect zones of gold-cobalt tourmaline breccia mineralization in the Backbone area and North West Cirque tourmaline breccia depression zone and associated copper porphyry mineralization at Red Springs Cirque. Ground magnetic data was acquired over IP profiles to map magnetic highs and lows potentially associated with the occurrence of gold and copper mineralization throughout the system. Simcoe's report, dated November 30, 2018, contains the full interpretation of the IP survey results and will be available to view on the Company's website: www.jaxonmining.com. At least 32 anomalous zones are interpreted along 7 lines as significant targets for follow up from surface to ~800 m+ depths (Figure 1). Out of the 32 anomalous zones, 16 are considered first priority (S#), 14 second priority (W#) and 2 are third priority targets (P#). A summary table and map show locations of interpreted targets (Table 1 and Figure 1). First priority zones show low resistivity gradient areas with moderate IP chargeability consistent with faults and shear zones with potential for structurally controlled sulphide mineralization. 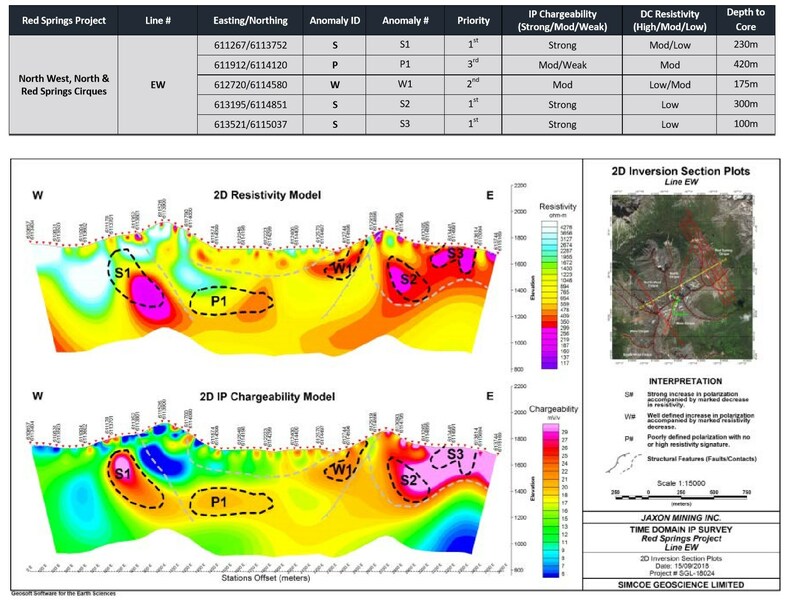 The interpreted second priority (W#) anomalous zones are generally large area responses at greater depth, where IP chargeability is strong and well-defined, with low to moderate resistivity associated with potential for porphyry sulphide mineralization. 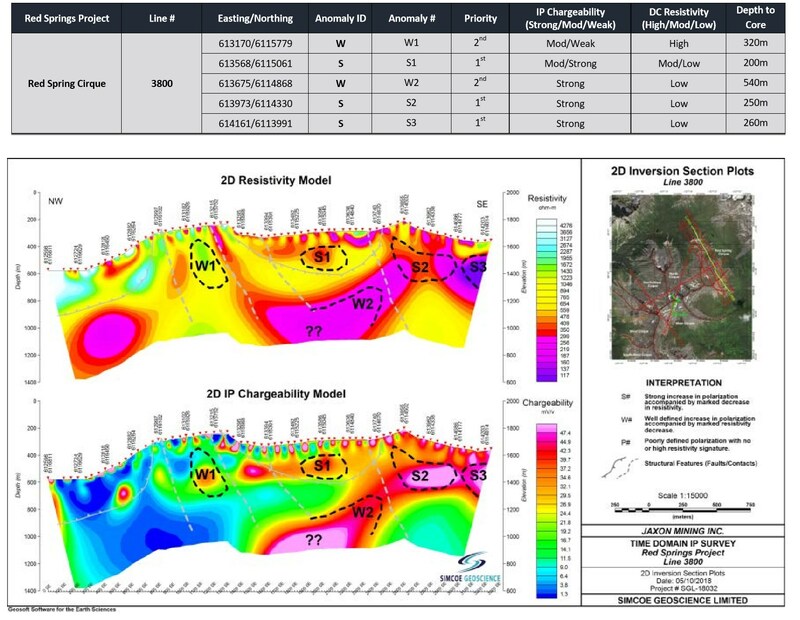 IP Line EN (Figure 2), along the Backbone tourmaline breccia zone, shows low resistivity with moderate IP chargeability faults and shear zones controlled sulphide mineralization anomalies such as S1 which should be tested in the 2019 drilling season. More importantly, IP chargeability is stronger to the West as indicated by both S1 anomalies of IP Line EW and L800 from IP Line EN (Anomaly area 1, Figure 1, Figure 4) which indicates the tourmaline breccia mineralization zone at the Backbone area may extend to the West more than 500 m.
IP lines L3400, L3600, L3800 and L4000 (Figure 1, 4-5) at the Red Springs Cirque area show strong IP chargeability anomaly with low to moderate resistivity association with potential for porphyry sulphide mineralization (Anomaly area 2, Figure 1). Dr. Yingting (Tony) Guo, COO, commented, "We are pleased with the results of the IP and ground magnetic surveys. The high-resolution survey consists of over 23,000 individual data points and the chargeability and resistivity inversions outlined a minimum of 32 anomaly zones. Out of 32 anomalous zones, 16 are considered first priority, 14 are second priority and 2 are third priority targets. This geophysical technique is an extremely useful tool allowing Jaxon to identify drill targets and to better focus drilling on the known gold-cobalt tourmaline breccia mineralization zone and distal porphyry targets. These survey results highlight a number of significant anomalies coincident with our geochemical and structural information and will be followed up in next year's field season. Jaxon will conduct additional geophysical, structural and geochemical studies and drill test a number of priority targets in the 2019 season. As 16 first priority IP anomalies in 2018 have not yet been tested, we can now use the anomalies highlighted in the geophysical work to better define and expand the number of occurrences of gold-cobalt tourmaline breccia mineralization and to test the porphyry targets. Design of the field work programs for the 2019 season is now underway." 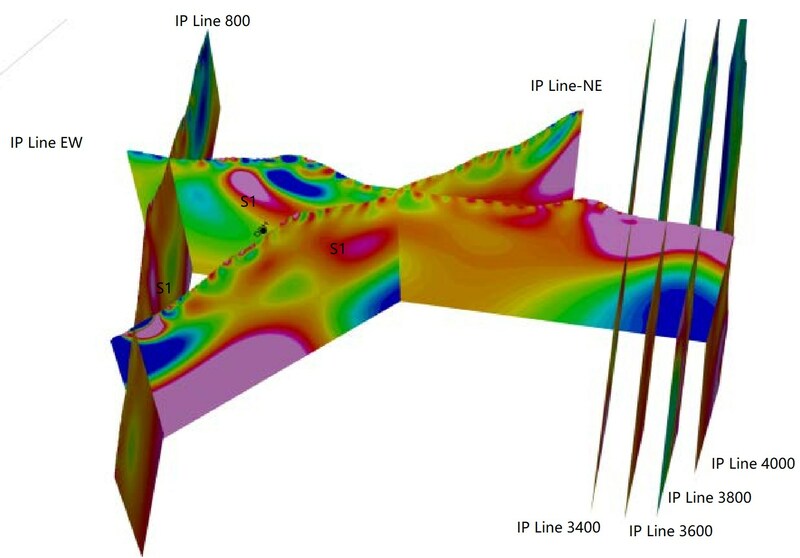 Figure 2, 2D IP and resistivity model of IP line NE along Backbone tourmaline breccia mineralization zone, showing S1 priority where there is a high grade gold-cobalt mineralization outcrop, W2 second priority which has been tested by hole BB18-03-05. Figure 3, 2D IP and resistivity model of IP line EW from Red Springs Cirque porphyry target area to the tourmaline breccia zone area, showing S1 priority where there are multiple high grade gold-cobalt veins outcropping in the depression area in North West Cirque. The S2 and S3 priorities are coincident with the copper-bearing dorite porphyry outcrops discovered in the 2018 field season. 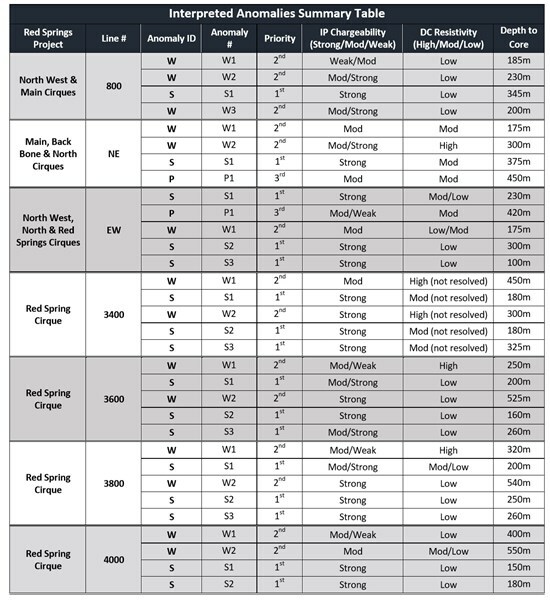 Figure 4, Backbone area IP sections looking North East, showing S1 and other IP anomalies may extend West to S1 anomalies in the both IP Line EW and Line 800. 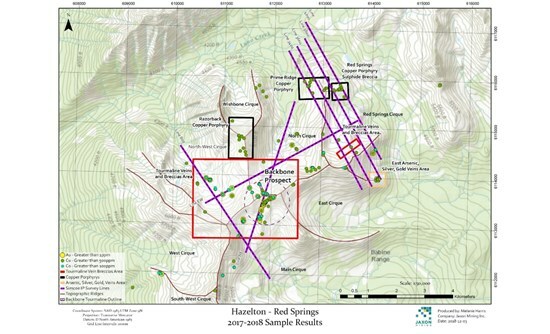 Figure 5, 2D IP and resistivity model of IP line 3800 in the Red Springs Cirque porphyry target area showing S1-S3 priorities where copper-bearing dorite porphyry outcrop has been discovered in the 2018 field season. 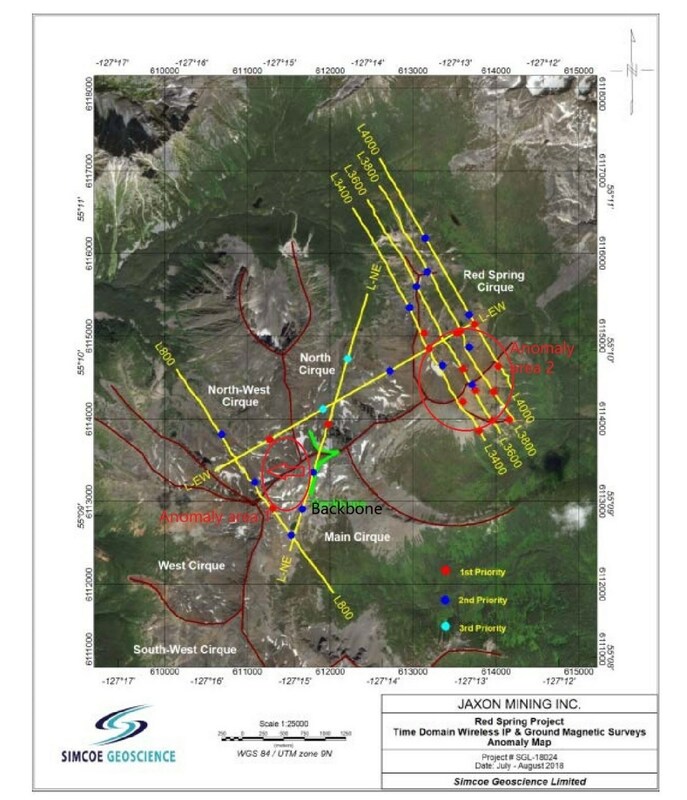 Located in Northwestern B.C., the Red Springs Project contains porphyry-related, sedimentary-hosted gold-cobalt tourmaline breccia mineralization with associated copper, bismuth and antimony (Figure 1). It is in a well-developed infrastructural area, only 10 km away from a major highway and 2 km from a local forest logging road. It is a new discovery for this type of mineralization in B.C. Tourmaline breccia mineralization in the "Backbone" area of the Red Springs Project is partially controlled by a low angle thrust fault occurring as sill-like tourmaline-sulfide zones within the fault and along bedding planes and as discordant breccia zones in the hanging wall of the fault. Mineralized intervals display multiple phases of hydrothermal activity accompanied by strong silicification and tourmaline-sulfide mineralization. Tourmaline-sulfide breccia zones and veins have been widely found in the Backbone, North Cirque and North West Cirque prospects. At Backbone, breccia mineralization extends over a strike length of 1000 m and is up to 15 to 50 m wide on surface (Figure 6). Gold grades from surface channel samples range from 1 g/t to 32 g/t Au, with cobalt and copper grades up to 0.36% and 8.33%, respectively. 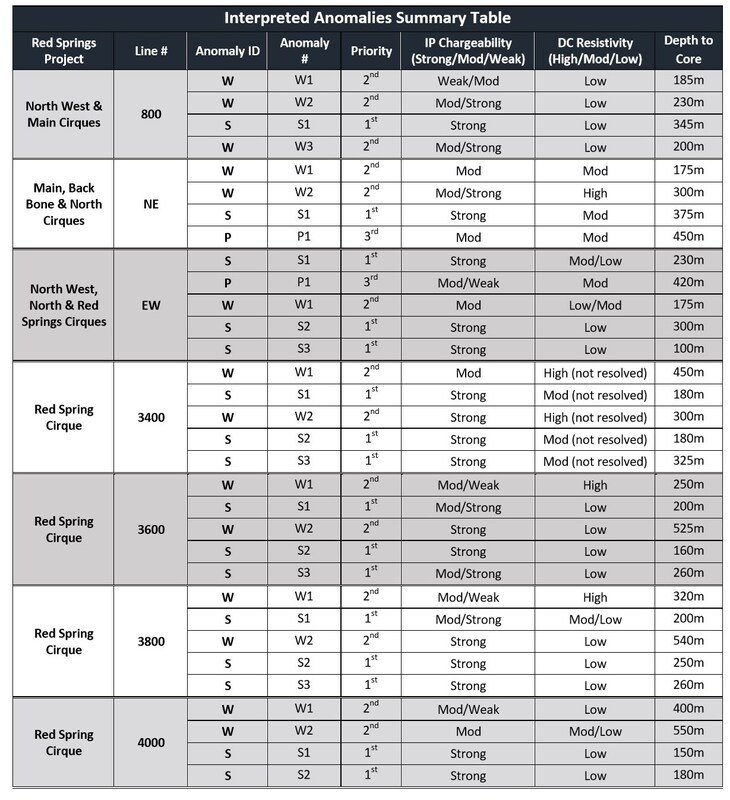 The 2018 drilling program has confirmed continuity of mineralization over a strike length of 300 m from hole BB18-01 to BB18-03 and low angle (<30 degree) dip extent of over 100 m from surface channels to the West. Mineralized tourmaline-sulfide breccia zones in drill core extend discontinuously over lengths of more than 26 m in BB18-03 at the down hole depth from 67 m to 93 m. It consists of different phases of sedimentary breccia and tourmaline veins or metrics. The sulphide mineralization within tourmaline breccia zone consists of pyrrhotite, arsenopyrite, chalcopyrite and pyrite. The most intense mineralization is associated with strong silicification and sulphidation alterations. A set of late quartz-carbonate veins are concentrated within the tourmaline breccia mineralized zone and contain variable amounts of chalcopyrite and bismuthinite. The cobalt grade can be up to 0.36% on the surface outcrops and 0.10 % in the drill hole cores based on the current exploration data and is closely related to the gold, telluride and bismuth grade within tourmaline breccia mineralization in both surface outcrops samples and drill hole cores. Based on the 2018 IP survey, the Company has identified a deep target for sulfide mineralization. IP anomalies extend from the Backbone to North Cirque and North West Cirque areas and cover a 2 km2 area (Figure 4) at depths ranging from 350 m to 430 m (Figure 4). Deeper drilling into one of these IP anomalies in the tourmaline breccia area will be the Company's priority in the 2019 field season. Jaxon is a precious and base metals exploration company with a regional focus on Western Canada. The Company is currently focused on advancing its Hazelton Project in north-central British Columbia and the More Creek Project (consolidating the Wishbone and Foremore properties) in British Columbia's Golden Triangle. For Capital Markets, please call 778-938-4459, for Investor Relations and Corporate enquiries, please call 604-398-5394.